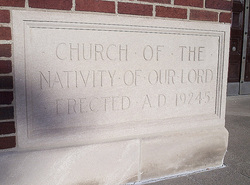 Nativity of our Lord was founded in September, 1911 when Bishop John Foley appointed Fr. Frederick Heidenreich to lead in the establishment of a parish on Detroit’s eastside on the border of the old village of Leesville. The first church was housed in the abandoned GratiotSchool, also identified as the LeesvilleSchool, on Harper across from the Gratiot Streetcar Barn. The first rectory was at 506 Cooper Street, a residence converted from an old barn. The following year in November, 1912 construction began on McClellan near Gratiot on the parish school that would also house a basement church. For a while church services were held at both sites; weekday mass in the old GratiotSchool and Sunday mass in the new school basement. In 1914 the school opened with 400 students, a teaching staff six of Dominican Sisters from Racine, Wisconsin and one lay teacher. In 1916 a convent adjacent to the school was completed with the capacity to house twenty sisters. Prior to that time the sisters had been living in adapted space on the third floor of the school. Construction on the present rectory on McClellan at Cairney began in 1921 and was completed in 1922. While there had always been a plan for a permanent church structure, it was not until September, 1924 that the parish had raised sufficient funds to begin ground breaking on the current church. Moreover, parishioners were charged with the task of raising an additional fifty thousand dollars by the end of the year in order to ensure that construction could move forward as planned. On Easter Sunday of the following year the cornerstone was laid. Edward A. Schilling was the architect and designer contracted for the project.His firm of Van Leyen, Shilling, Keogh and Reynolds, Architects also designed theCasino on Belle Isle, Detroit City Hall and Fordson High School in Dearborn as well as the churches Holy Family, St. Theresa of Avila and St. Thomas the Apostle. By late 1926 construction had progressed enough to allow the celebration of the church’s first mass on Christmas day. By the end of 1928 the interior of the church was completed with the installation of the altars, terrazzo floor in the sanctuary, wainscoting, pews and confessionals. All the aisles are laid with tiles created by the Pewabic Pottery of Detroit. A Moeller organ containing fourteen hundred pipes was installed in 1931 and the glass mosaic Stations of the Cross, created from original drawings, were set in place in 1935. Sometime around the time of the Silver Jubilee in 1936 installation of the stained glass windows was completed. These windows were created by the Conrad Schmitt Studios of Milwaukee, Wisconsin. The finished church had a seating capacity of twelve hundred. The record is sketchy regarding other appointments in the church. Sometime during the 1950s the painted wood altar rail was replaced with one of marble. During the mid-1960s as a result of changes brought about by the Second Vatican Council, the carved wooden pulpit was removed and unfortunately lost to history. The sanctuary was extended out into the body of the church and the high altar was torn out and replaced with a smaller one that was moved forward, facing the congregation. Several of the pews in the front and rear of the church were removed.The current seating capacity is now slightly under six hundred. From the early 1990s to the present day the church has undergone a series of planned renovations and repairs. In 1994 an elevator was installed in the north transept creating barrier-free access to the basement social hall. This addition necessitated relocating the Pieta from its position there to the rear of the church where it currently stands. After St. Stanislaus Church closed in1989 Nativity received the altar as a gift. This massive, eight-foot, black and white marble structure was more in keeping with the over all vast scale of Nativity.The altar that had been in use since the mid-1960s was moved to the rear of the sanctuary. Decorative painter, Jeffrey Duchene, created castings from molds taken from the side altars and baptismal fount to simulate the appearance of the original altar that had stood in this location. Other renovations took place to remove some of the mid-century modern fixtures. New carpet was laid, the pews were re-varnished and the floors were tiled in the areas where pews had been removed.The intent has been to honor and restore as much as possible the original beauty of the church and to maintain it in good condition.